When you make Korean traditional food, such as Doenjang soup, Kimchijjigae, and other dishes, do you use special sauces? To this question, most people would say that they heavily rely on artificial flavor enhancers. These days, the number of people using artificial flavor enhancers in daily cooking is sharply increasing. In spite of this trend, there is one chef who refuses to use the artificial flavors. 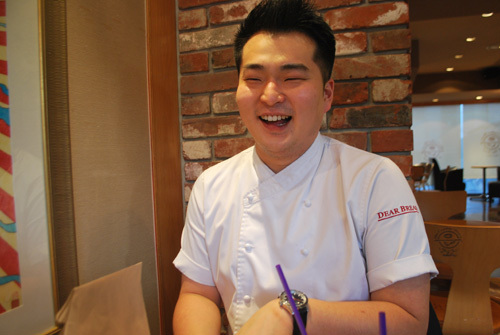 He is Lee Won Il who currently runs Dear Bread. Let’'s meet him! Q1. You changed your major from Business Administration to Hotel Dining Room Management. Is there a special reason for that sudden change? Before serving in the military, I traveled in Southeast Asia; Hong Kong, Singapore, Taiwan, and the Philippines. From this travel, I realized that, in the world, there are many people who are fluent in English. I thought I had to follow this trend, and I decided I would become fluent in English myself. Therefore, I started to prepare for transfer to a foreign university. Fortunately, I made it. In a foreign country, I could have the freedom to choose subjects related to cooking. In Korea, taking courses connected to cooking had difficulty because my parents didn't want me to be a chef. When I graduated from the university, my parents knew that I took cooking courses without taking business courses that were needed to graduate as a student in the Department of Business Administration. Finally, due to this situation, my parents gave their approval for me to pursue my dream. Q2. During the cooking competition, "Yes!Chef," what was the most difficult thing? When I was participating in the competition, the knowledge I had about cooking was what I had learned in the university and from my mother. I was an amateur in comparison to the other competitors who had improved their cooking ability for many years. Moreover, while my field in cooking was Korean food, the panels of judges in the competition were the professionals in Western food. Korean food and Western food are different in the cooking process, the order of seasoning, the intensity of fire, and in other ways. These various ways of cooking gave me difficulties in meeting the judges standards. Therefore, to survive in the competition, I studied again and more deeply than what I had learned in the university. Even if studying deeply was a tough experience, I could be even more mature as a professional chef, no longer an amateur cook. Q3. 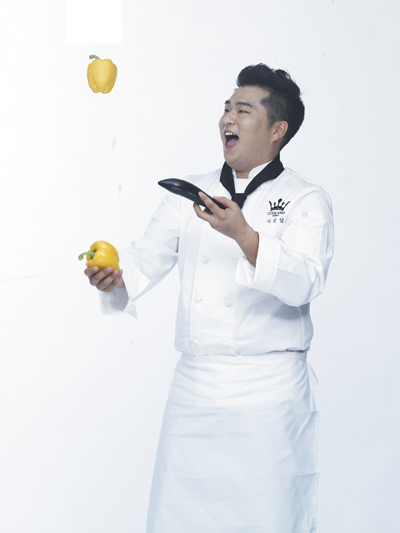 In "Yes!Chef", what is the most memorable assessments or statements you got from Edward Kwon? There are two statements I couldn't forget and he touched me deeply. One is about meat. Fortunately, he and I have the same preference in the degree of cooked meat. Every time when he had a taste of my dishes, he said, "The meat is perfect!" As an amateur chef like me in such competition, this statement became an encouragement for me in extreme competition. The second one is when I worked in Edward Kwon's restaurant. To my surprise, in the competition, he had a good impression of me, and after the competition he suggested to me to work in his restaurant. At first, I appreciated this invaluable opportunity. However, as time went on, my pleasure decreased slightly. There are no restaurants as painful as his restaurant. Due to this laboriousness, innumerable beginners start to work and cease to work soon after. Like other ordinary cooks, every night after exhausting work, I wanted to leave. However, I withstood this difficult time and became the last one to survive in Edward Kwon's extreme workplace. At that time, he said, "You are as dogged as me." Only this short statement made me forget all the difficulty I experienced in the job, and finally I felt like I was recognized by him. Q4. Unlike other kinds of dishes, varieties of Korean dishes are fixed. What do you think about this situation? There are many causes for why Korean food's varieties are limited. I think that the customers of Korean foods have played the main role in limiting the variety. If some chefs make Korean dishes splendidly in more different ways than the original cuisine, Koreans consider this new food as fusion cooking, denying the creation of Korean food's variety. Therefore, broadening Korean cuisines requires not only making new cuisine as a cook but also for customers to accept that new cuisines. Q5. You had a strict rule not to use the artificial flavor enhancers. Is there a big difference between using them and not using them? Yes. The food with artificial flavor enhancers is completely different compared to the food without them. Even a small quantity of it has a great impact on food. The artificial flavor enhancers are efficient in producing tastes in food. Therefore, as a chef, not to use it was a hard decision. However, as a Korean food chef, I wanted to have customers recognize the original taste without artificial ingredients, and show them how perfect the food is when cooked without them. Due to this desire, I still have the strict rule about not using artificial flavor enhancers. Even though it was hard, it helped me to develop my own cooking capacity. Q6. These days, you are appearing on the TV Show, "Asking Refrigerator." what made you decide to appear on this show? I think the characters of that TV program have played an essential role in my accepting that casting. Compared to other cooking TV programs, its plot focuses not on celebrities, but rather on the chef. Moreover, I think that it would be positive stimulation to cook in a limited period of 15 minutes with limited ingredients prepared in refrigerators. "Asking Refrigerator" is filming for 12 hours at first. Before making foods within 15 minutes, chefs seem to smile and talk to each other. In effect, they are busy planning how to cook by using the ingredients of celebrities' refrigerators. It can be pressure on me, but I love it. Q7. How do you come up with ideas about new food? Other professionals have their basic options according to diverse situations: like reporters remembering various layouts in their brain, I have similar options to them. I make these options by eating various kinds of food. Naturally, studying about the ingredients is also integral. For example, the "Nangjanggo Tang" that I made in "Asking Refrigerator" was based on my knowledge accumulated for over ten years. To make that cuisine, the knowledge about eliminating the fishy smell and the mackerel’'s features is required. Q8. What is your future plan as a Korean traditional chef? I want to spread interest in Korean food all over the world. Unfortunately, there are only a few well-known Korean traditional chefs. Furthermore, the Korean food chefs who can speak English are rare. As one of the Korean chefs who can speak English, I feel a responsibility to inform the attraction of Korean food to the citizens of the world. For the globalization of Korean food, I planned to make some videos. However, because it takes a lot of money to make videos about Korean food, now I am just in the process of designing it. I hope I will be able to make videos soon. If someone hears my plan, they might say that Korean food doesn't have universal tastes that the people of the world outside Korea are likely to enjoy. Due to Korean food's unfamiliar taste, it would be difficult to spread Korean food over the world. However, I don't agree with this opinion. Not only Korean food but also other countries' traditional foods require an adjusting period. I believe that Korean food has more potential to be a world food. I will try to do my best until foreign people gobble up "Gochujang." To shorten what I want to say, don't worry about if you will fail or not. Just focus on how you can do your favorite things well. It is not too late to feel the frightening feeling after failure. After finding what you love and what you are good at, just rush into it without hesitation. For example, I had many jobs, which I wanted to be, such as a potter, a photographer, a teacher, and a fabric designer. If I had favor things, I was immersed in them until I felt bored. Finally, I decided to become a chef. Each person have his/her own fields that they are strongly interest in. I hope you can find it through lots of experience.